At first, I was not going to see this movie. I am a tried and true, full on, he can do no wrong, fan of Matt Damon and his best work, the Bourne Trilogy. Robert Ludlum only wrote three books. Where the heck did The Bourne Legacy come from? And, you think you can just replace Matt Damon. Jeremy Renner is a good actor, but he is no Matt Damon. But, then I calmed down, came back to reality and looked a little further in to this movie. I get it now. The Bourne LEGACY – this is what happened after the fact. Drop a bag over this. And, these lines deserve mention because they added a little comic relief to a very intense movie. If you are a Jason Bourne fan, you will enjoy the movie because it takes the concepts in the original trilogy to an extreme and scary level. If you are a Jeremy Renner fan, you might be disappointed. Anyone could have played this role. If you want visit a dozen international cities in 2 hours, experience a pretty cool motorcycle chase and finally realize why you were required to take that basic biology course in college, then by all means. Go see this movie. BTW, I am starting a Jason Bourne meets Aaron Cross movie petition. That movie must be made. Who’s with me? Previous Tattoo Tuesday – Does your tattoo artist have a style? I really enjoyed the film as well! 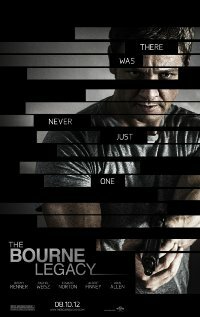 Renner was his own character, not a replacement for Bourne. Yeah that made me feel better about seeing it. Tried and True Matt Damon/Bourne fan. I also said no way I was going to go see this movie – no Matt – no me! But after this I may give it a shot. But there will never ever be another Jason Bourne. I am thinking they didn’t do a good job of marketing this film because we are not the only ones who thought this. I am thinking they didn’t do a good job of marketing this film because we are not the only ones who thought this. Take a look and let me know what you thought. Thanks for this review! Now I am not so apprehensive about seeing it as I, too, am a fan of Matt Damon and the origial trilogy. It is worth a look just to see the progression of idea brought up in the Bourne Trilogy. Go see it and let me know what you thought. Oh, Tameri. I would go with you. But, DVD are awesome for that fact. Enjoy on your own time over and over again. Let me know how you like it.